Difference between revisions of "First United Spanish Mennonite Church (Vancouver, British Columbia, Canada)"
First United Spanish Mennonite Church (Primera Iglesia Menonita Hispana) in Vancouver, British Columbia is a daughter church of First United Mennonite Church. Their first meeting was in November 1990 and the congregation was officially organized as a church in 1996. The congregation meets in the facilities of the parent church and has been affiliated with Mennonite Church British Columbia since May 1992. They are also affiliated with the Spanish Mennonite Church of North America and the Council of Mennonite Churches of North Pacific. The first pastor was Artur Bergen from Paraguay. After Bergen returned to South America the congregation was served by a part-time pastor from Chile, Omar Cortés Gaibur, who stayed for short time while studying at Regent College. In 1996 Jorge Hoajaca was invited to be pastor. He and his wife Ericka worked very hard to establish the church. In spite of the challenges of working with a congregation of immigrants and refugee claimants, the church has experienced slow but steady growth. In addition to Hoajaca, the congregation has been served by two lay preachers, Arturo Nacho and Hna. Teresa Galdamez. As well the congregation has a moderator, Patricio Fernandez, who has served for several years. The moderator has been a great support for the pastor and the church, especially in difficult times. As a Spanish congregation their services are conducted in Spanish with translations in English. Members of the congregation are from different Latin America countries, including Guatemala, El Salvador, Nicaragua, Mexico, Colombia, Bolivia and Chile. Even though the services are in Spanish the congregation has some members from Canada and one First Nations member. First United Spanish Mennonite Church has programs for children, youth, women, senior, families and new immigrants. They are committed to working with newcomers from Latin America, and have learned to preach a holistic gospel. The congregation operates a Resource Office that is financially supported by Mennonite Central Committee. Through this ministry they support refugee claimants, refugees and other immigrants. Sometimes they minister in the Downtown Eastside of Vancouver serving food. They are also involved with other ministries alongside other churches, like ESL classes and a food bank. In 2009 the congregation reported an average Sunday attendance of 75-90, an increase from the average of 65-72 reported in 2008. The congregation baptized 10 people in both 2008 and 2009. In spite of the transient nature of ministering to immigrants and refugee claimants, the congregation continues to minister, strengthened by a core group of families based in Vancouver. Mennonite Church British Columbia. New 'n Notes (Oct/Nov/Dec-2009). Harms, Kelly. "First United Spanish Mennonite Church (Vancouver, British Columbia, Canada)." Global Anabaptist Mennonite Encyclopedia Online. February 2016. Web. 25 Apr 2019. http://gameo.org/index.php?title=First_United_Spanish_Mennonite_Church_(Vancouver,_British_Columbia,_Canada)&oldid=142377. Harms, Kelly. (February 2016). First United Spanish Mennonite Church (Vancouver, British Columbia, Canada). Global Anabaptist Mennonite Encyclopedia Online. 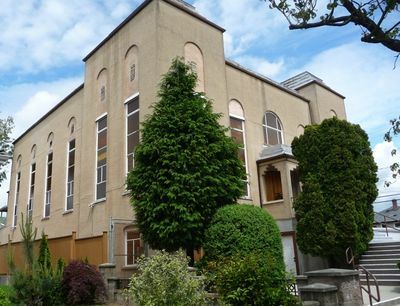 Retrieved 25 April 2019, from http://gameo.org/index.php?title=First_United_Spanish_Mennonite_Church_(Vancouver,_British_Columbia,_Canada)&oldid=142377.